Pray for Nicaragua – an update on the situation and travel warnings. The unrest started with reports that the government under the leadership of Daniel Ortega was planning to make some big changes to the social security system. Workers would have to pay more into the system, and older pensioners would have to pitch in more for their share of healthcare. 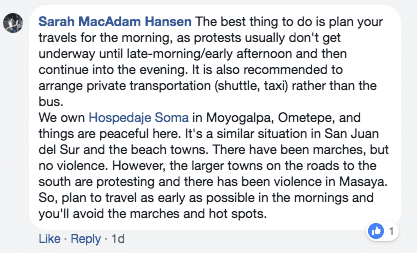 Travelers currently in Nicaragua are reporting looting, rioting, and road closures. Political rallies and demonstrations are occurring daily, often with little notice or predictability. Some protests result in injuries and deaths. Demonstrations typically elicit a strong response that includes the use of tear gas, pepper spray, rubber bullets, and live ammunition against participants and occasionally devolve into looting, vandalism, and acts of arson. Both the Government of Nicaragua and the U.S. Embassy in Managua are limited in the assistance they can provide. If you feel unsafe in Nicaragua, consider arrangements to depart the country. While the situation in Nicaragua is dangerous, our thoughts and prayers are with the citizens of the country who are demonstrating for their freedom and rights. We urge calm in #Nicaragua. Gov’t of Nicaragua should respect peaceful protesters’ right to free expression & assembly. Repressing protesters & censoring news are not consistent w/democracy. The Nicaraguan people deserve better. If you’re in Nicaragua currently, please add your comments below to help people plan accordingly.